Founded in 1987 and located in Pataias since that time, Nevex specialises in and is geared entirely to the manufacture of soft tin-based solders, alloys and related fluxes, and prides itself on its strong sense of responsibility and stringent standards. 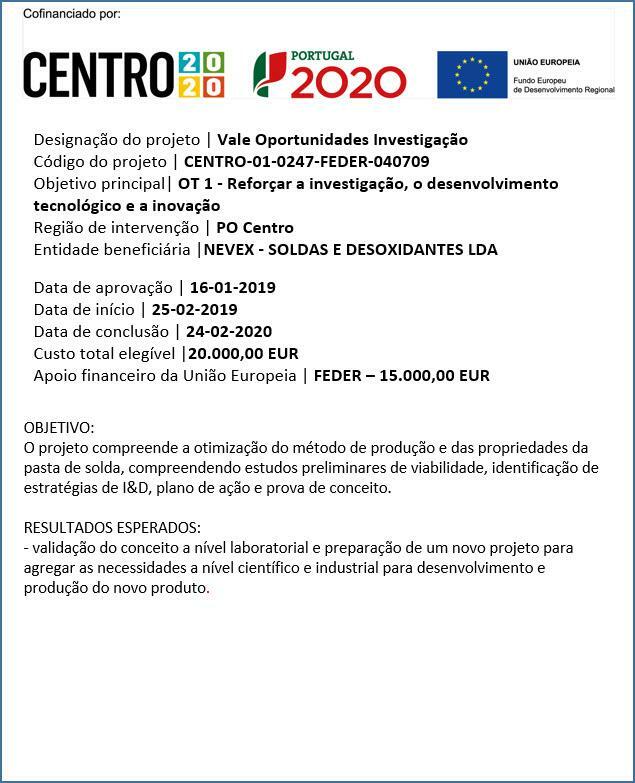 The team’s industry expertise and experience built over the years as a result of the close contact with the electronics, automobile, metalworking, electrical, civil construction, shipbuilding industries and renewable energies, are the prize asset that makes the Nevex products different from the rest. We provide quality certificates and safety data sheets for these top quality products, which are the result of our readiness to continuously refine the processes and improve the techniques used. We are a family-run company with a solid presence in Portugal and abroad, showing that if you drive your dreams you drive your life, provided that you put a lot of work and dedication into it. Our clients have been our friends and allies over the years, and that has been a key-factor for Nevex’s growth and consolidation in the market. We define ourselves as importers and exporters, customising our products and maintaining synergy relationships with every client. This is why ‘customisation’ and ‘internationalisation’ are some of the words that best define our present and what we look forward to in the future. Our primary mission at Nevex is to respond to the solder market requirements, basing our activity on pillars such as quality and continuously monitoring the customised service offered to the client. Our aim is to stand out as a reference in the solder and sealant industry, consolidating our presence in both the Portuguese market and abroad.